Last night I found myself mixing plain yogurt into my rice and then spooning it into my mouth with mango pickle. It tasted soothing, nourishing, spicy….and incredibly delicious. My husband always ends his meals in this traditional South Indian manner. He also eats his meals in “courses” – first plain rice mixed with the vegetable of the day. Next, rice mixed with lentils and finally rice mixed with yogurt. I have always regarded his step by step meals with some amusement. Since when had I crossed over to the other side? I think I sprouted South Indian taste buds at the moment that I first tasted hot curd rice wrapped in a banana leaf in the early hours of the morning at the Tirupati temple. 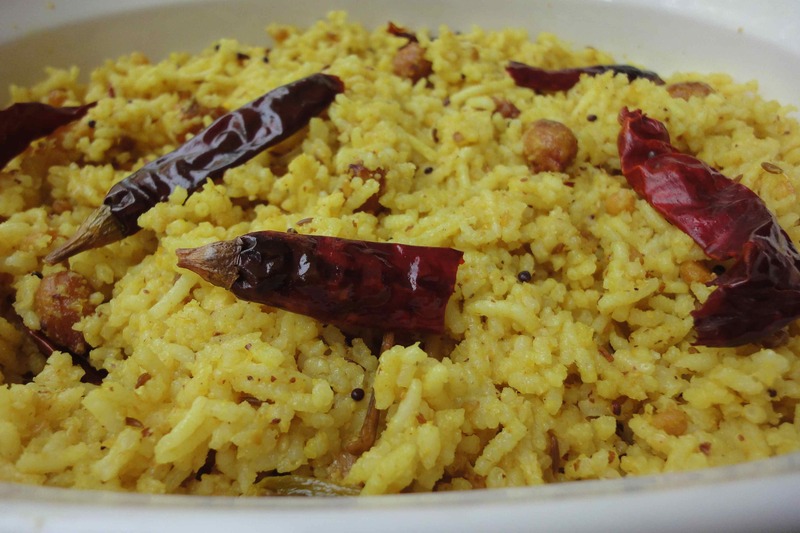 Later, I stood in line as a priest doled out a palmfuls of pulihora or “tiger” rice as this spicy, sour, yellow, studded with peanuts rice is called, at the twelfth century, intricately carved temple of Simhachalam. As for the rice and yogurt combination that I’ve been late to adopt, perhaps a dormant taste bud ? gene? was finally surfacing. My mother-in-law makes a fantastic puli rice, so here it is, freshly cooked minutes ago. The phone instructions for this rice have never worked for me. It’s because I’ve not been able to envision how to cook the tamarind sauce for this rice. How much water in the tamarind as it soaks? How long does the tamarind cook for? What goes in the tarka and in what order? While cooking, I find out that it’s much easier to use a small 5-6 inch pot for cooking the sauce as the tamarind water bubbles and releases oil. My mother-in-law’s secret ingredient here is toasted and ground sesame seeds, along with crushed raw mustard seeds, both of which are mixed into the rice at the end. I’m missing fresh green curry leaves today, but they are a must. This rice is eaten entirely on its own. 1. 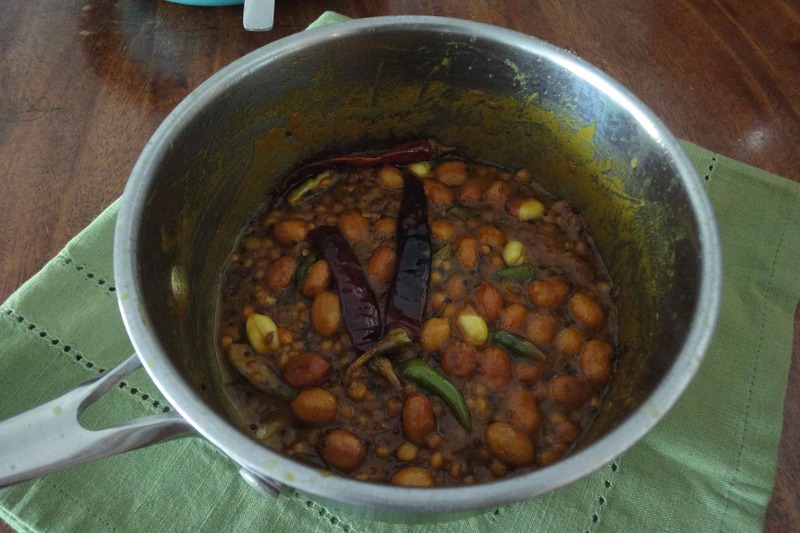 Heat the oil in a small pan and add the tarka ingredients in the order listed: chana dal, urad dal, methi seeds, mustard seeds, cumin seeds, asafetida, red chillies, green chillies and curry leaves. Importantly, the chana dal, urad dal and methi seeds must cook for an extra half minute before the other quicker-cooking ingredients are added. Add the tamarind extract in the 1/2 cup of water along with the salt and sugar and turmeric. Cook until the oil is released. This takes at least ten minutes on medium heat. You will see drops of yellow oil floating on top of the tamarind sauce and the paste will have visibly thickened. At this time remove the paste and keep aside. The paste should taste very sour and salty. 2. Meanwhile, put the cooked rice in a bowl (can be hot or cold) and stir in the paste with your fingers. Add the roasted peanuts, the roasted ground sesame seeds and the powdered raw black mustard seeds. Stir well and taste for 1. sourness 2. salt. 3. level of heat. Adjust for any of those by adding a little more tamarind soaked in warm water, salt and red/green chillies cooked for a few seconds in a touch of hot oil. The flavors in the rice deepen as it sits for a few hours. It’s delicious all by itself and makes a great dish to bring along on a picnic. 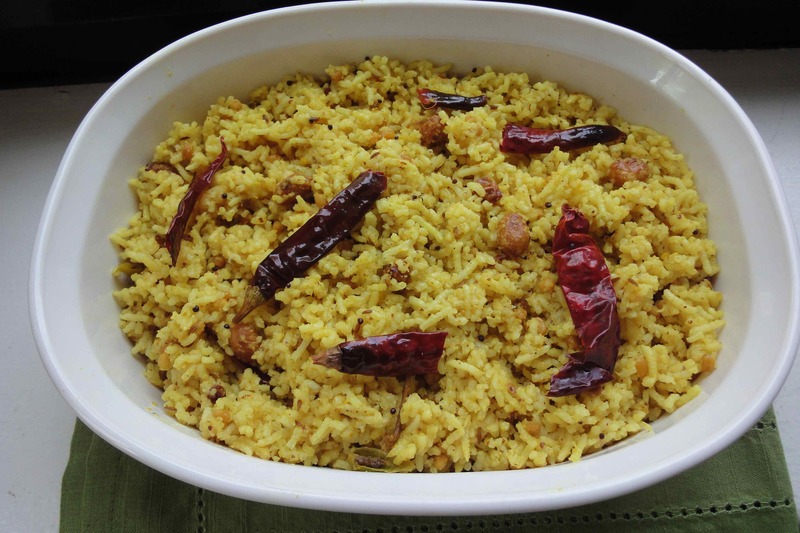 I have had tamarind rice in restaurants and always wanted to try making it at home. So I thought I’d give it a try with a cupful of left over rice from yesterday. It came out so delicious I gobbled down most of it without offering it to my husband. Well, there is a bit left for him to taste. Best of all it is so quick and easy to make. I left out the green chilis and increased the sugar for a more mellow taste. This is definitely going to become a fixture in my house. Thanks Devika! So glad you made it! Thank you for the feedback!! This looks delicious. My partner is no fan of tangy foods and I could devour that whole saucepan of the puli all by myself. I am so making this tomorrow for lunch.